My mouth started watering to the point where I was literally drooling as he placed a plate of street tacos in the middle of our table. My mind started racing. “How long do I have to wait before I can grab one without looking rude?” “Can I stuff the whole thing in my mouth in one go?” “Do you think the group would notice if I stole more than one?”. The tender, succulent meat had been smoked & slow braised for 12 hours, and was sitting in plated of me with pineapple and habanero glaze on a hand-made corn tortilla. Nothing this sensational had touched my lips in well, forever…don’t tell my husband! We were at The Mission on a lunch tour of Old Town Scottsdale with Arizona Food Tours – and while the remainder of the menu at the Mission (modern Latin cuisine) was also putting me dangerously on the edge of drooling in public, we were quickly whisked from the chic and sophisticated dimly lit lounge for another taste sensation. Pulled-pork street tacos at “The Mission”. Drooling over pulled-pork street tacos. 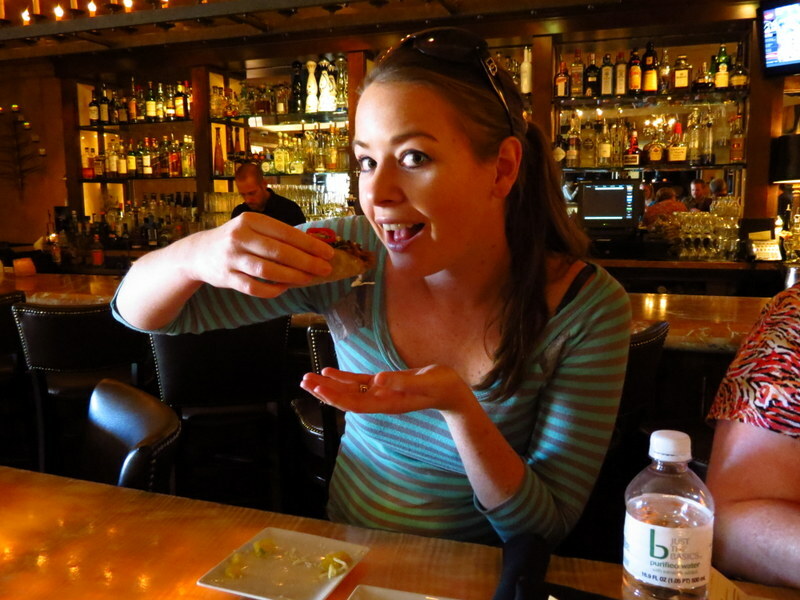 Ranked one of the top activities in Phoenix, the “Taste of Old Town Scottsdale” is the original Scottsdale food tour. I had purposely not eaten breakfast in preparation for a three hour adventure through what was once the wild west, which included the heavy consumption of distinctive food and wine from some of Scottsdale’s unique restaurants and shops. 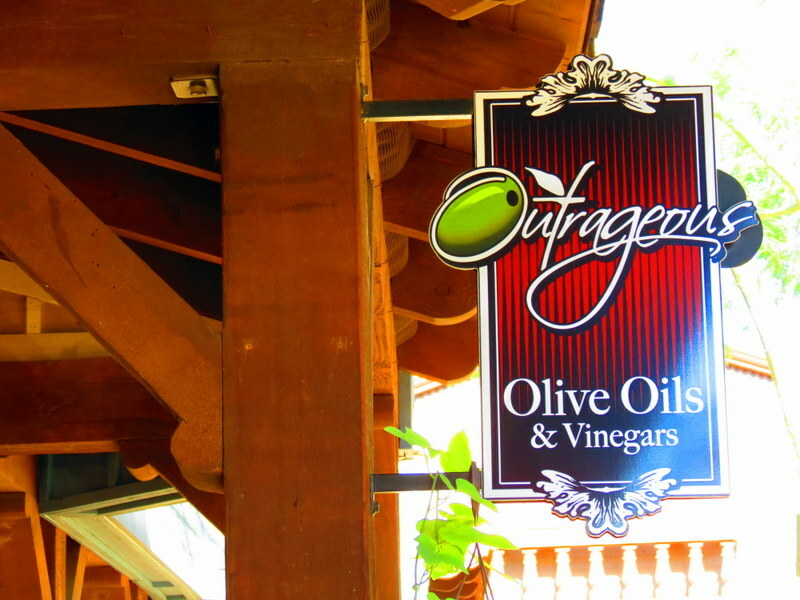 The second stop of our tour took in a tasting at Outrageous Olive Oils & Vingears, and until this point I had never thought twice about olive oils as an enhancement to a meal. Blown away by (a) the freshest and highest quality extra virgin olive oils, (b) the diverse range of flavors of olive oils and Balsamic Vinegars in existence, and (c) that there was so much to consider when choosing to purchase an olive oil, my life will never be the same again! A wealth of information, Heather gave us the run down about what makes a good olive oil, the conditions of an olive harvest, and the unique ways to add a flavorful burst to a usually bland dish with the many different varieties of olive oil! We sampled everything from singular olive oils, to those mixed with a vinaigrette, and even yogurt topped with an espresso vinaigrette, which was amazingly delicious. 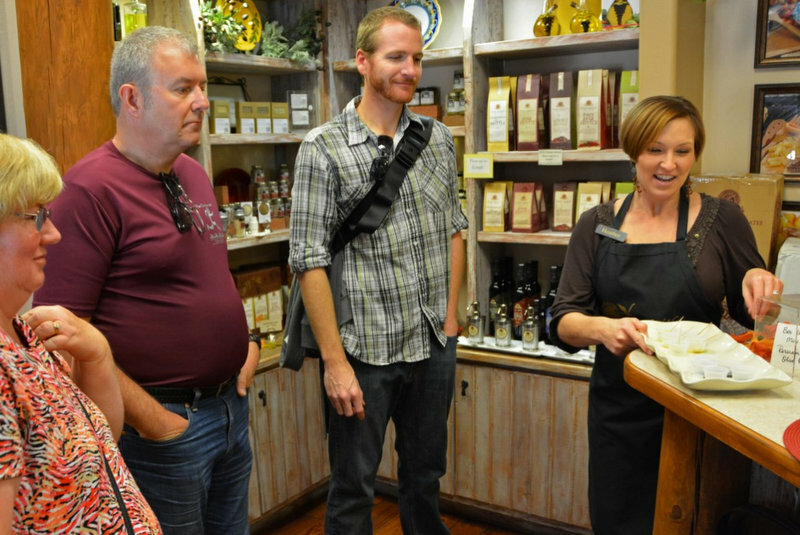 There was then time to browse the store, full of great gift options for family and friends, with some of the freshest and highest quality olive oils from around the world on sale. Outrageous Olive Oils & Vinegars. Heather offering our group an olive oil tasting. Photo by Forget Someday. Following this, we exited the “old west” area of Old Town and continued on towards the art district for some tantalizing Thai starters at Malee’s Thai Cuisine. Something you should know about me: I’m happy to engage in completely unethical behavior if we’re talking about a good spring roll. While the group was going crazy over the famous Tom Ka Gai soup (a hot & sour soup made with chicken, mushrooms, fresh lemon grass, galanga root, kefir lime leaf & coconut milk), I took that as an opportunity to devour the plate of spring rolls. After I realized just how unbelievable these were, I “took one for the team” and volunteered to continue tasting on behalf of Sam from Forget Someday who had a gluten allergy (which Arizona Food Tours were very accommodating with – our guide Zach would call each restaurant ahead of time to confirm there were gluten free options available). Filled with egg, celery, carrot, glass noodles and Thai spices, these spring rolls were easily the best I have tasted in my life. Juicy, succulent and with just the right amount of flavor – my next lunch date is in Scottsdale at Malee’s. Will kill for a good spring roll. 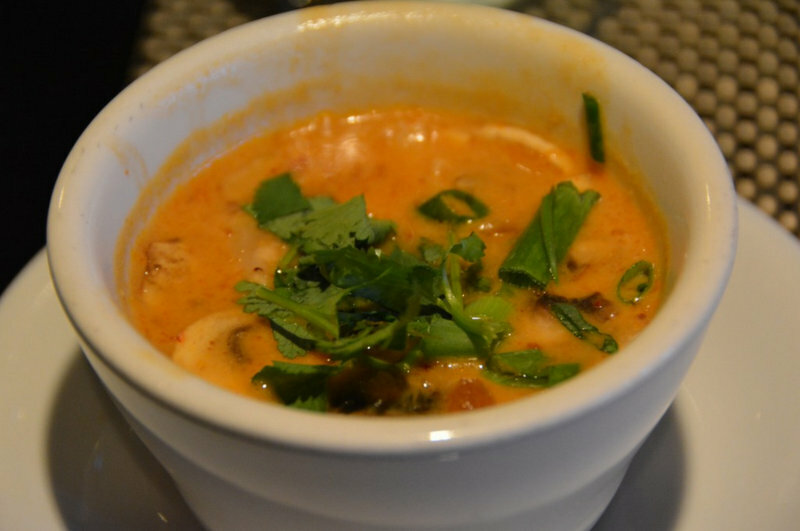 The famous Tom Ka Gai soup. Photo by Forget Someday. Back off – they’re MINE! After consuming as many spring rolls as were served, we moved from the art district to the fashion district, where we hit up 5th & Wine for a sangria toast – with live music every Thursday, Friday and Saturday night, this is Scottsdale’s favorite restaurant, disguised as a wine bar. Priding themselves on serving a wide array of simple, flavorful, food at moderate prices, we were presented with quite a selection of appetizers including hummus, tzatziki and cucumbers, two types of bruschetta, homemade meatballs, burrata caprese, and fried pickles! Everything was, of course, delicious. Click to enlarge individual photos. Serving a wide array of fabulous food. But wait, there’s more! Our tour continued on for stops at the well known Cowboy Ciao, (an eclectic restaurant offering New American meals with Southwestern accents dished out in funky environs decorated with cowboy art), and Super Chunk Sweets and Treats where we gorged on their unique cookie creations and home made ice-cream for desert. Though what was fascinating beyond the tantalizing tastes Old Scottsdale had to offer, was learning of her history along the way. While the tour is a solid food tour, we learned more about the history than most regular walking tours of the city are likely to offer. We truly benefited from our guides knowledge (try and get on a tour with Zach Egedy) about the area, as he told tales of how Socttsdale was established, how the town has changed over the years, and of course all of the great things Scottsdale has to offer today. I can highly recommend Arizona Food Tours as a fantastic way to kick start your visit – a walking tour which opens your mind and palette with tales full of rich history. Tip: When coming to Phoenix book this tour for the beginning of your visit. It is a fantastic introduction to the city, and you will really benefit from your guides knowledgeable suggestions for activities, restaurants, shopping and nightlife. Toccara, myself and our amazing guide Zach munching down on cookies at Super Chunk. Toccara and Sam from Forget Someday went on the same tour! Check out their account and photos as well! 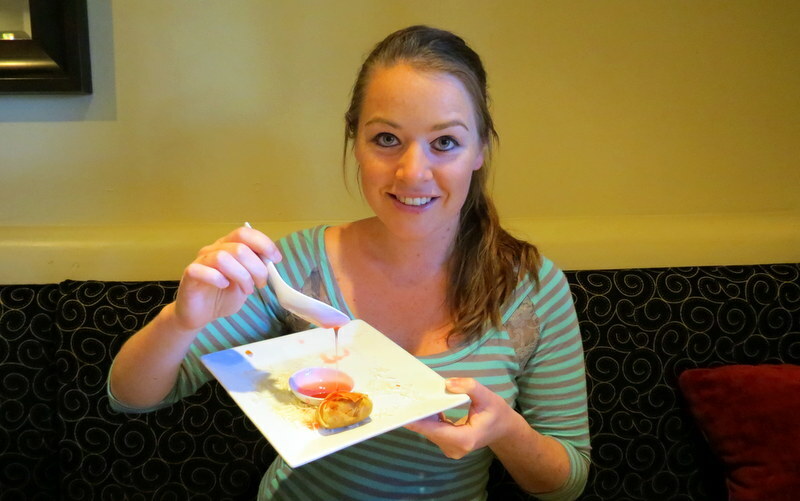 Arizona Food Tours partnered with Mapping Megan to provide us with a complimentary food tour. 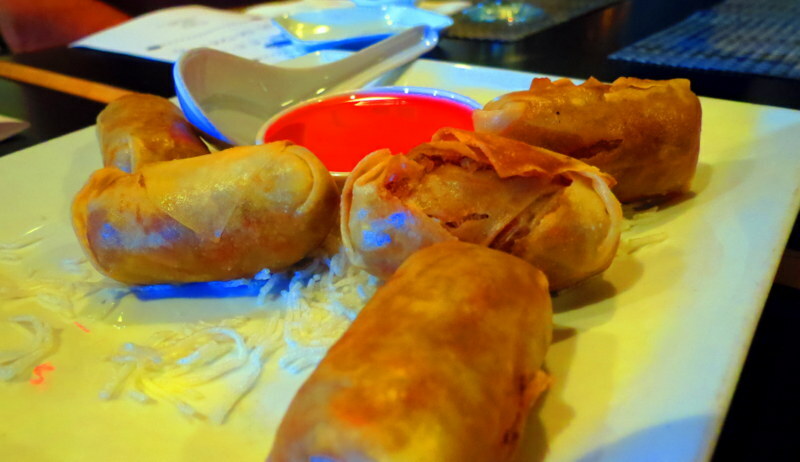 All opinions are our own – 5 spring rolls were harmed for the completion of this post. Arizona Food Tours runs a variety of different lunch and dinner tours – head over to their website to book your tour today! Yummmm! Getting hungry just thinking about the wonderful food we devoured! 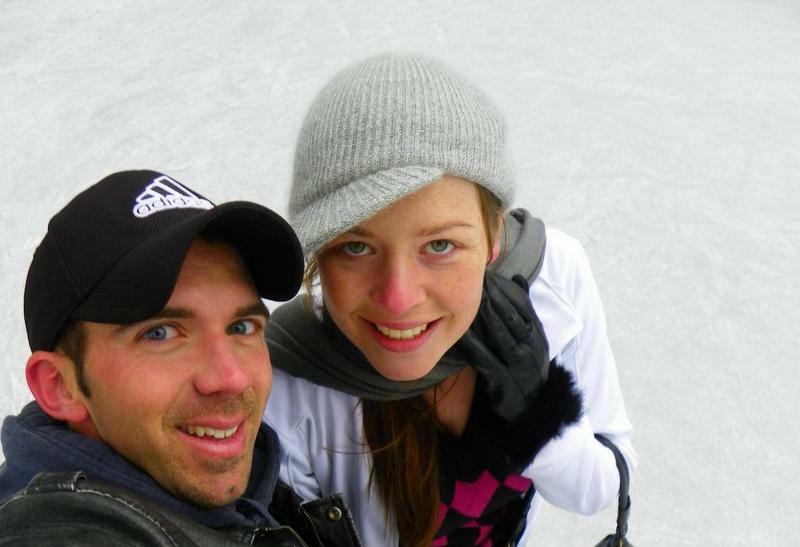 Definitely a recommended tour for visitors (and locals alike) to Scottsdale! Many great restaurants and scrumptious samplings! I know! I was editing my photos and having to keep my drooling in check lol! Your descriptions are as vivid as the pictures. You have me drooling, now how can I go to bed without a midnight snack. There goes the New Years resolution. I absolutely love Cowboy Ciao, especially their famous chopped salad. I didn’t understand what all the fuss was about until I tried it myself. Their chopped salad was amazing! Bringing back very fond memories!! I always try to steal more food when I’m ordering with a group, especially if there’s cheese involved. Sometimes it’s for this reason that group tours are amazing – you can always play dumb when food goes missing and blame it on someone else lol! Seeing these photos I can see why your mouth was watering! I have often thought about going on a food tour but have yet to actually commit to one. Maybe, after reading about yours, I will book us on to one in the near future. Would you believe this was my first ever food tour – I really didn’t know what to expect, but loved it! There will be many more in the future! Definitely look at booking onto a tour in your next destination – such a fab way to discover a new place! Very envious indeed!! We always talk about taking food tours whenever we travel but either we don’t find time or simply we have too many other bridges to cross. Definitely inspired me to look into such tours though in the future! Definitely look at setting aside time for food tours in the future – the great thing is you hit all of the best restaurants in the area in one go, and can sample some of the best cuisine from all! One of the best ways to figure out where you want to make your proper dinner reservation! Did someone say hummus? 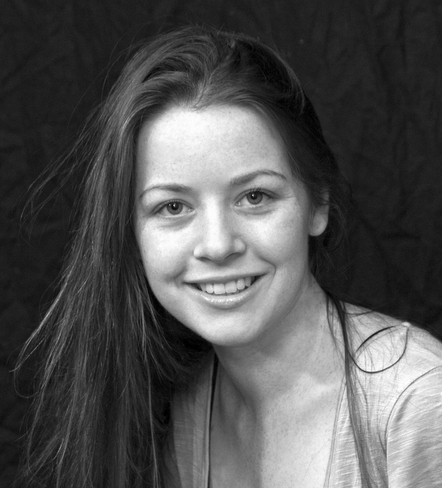 (As I type this, I seriously have a mouthful of hummus in my mouth – I eat it like, every day). Sounds like a great food tour! Always fun to try new places around the city – great samplings here and there so you can go back later for a full meal at your favorite places! Lol sounds great – I’m a mad hummus fan so I went to town on the plate in this tour! It really was a phenomenal food tour. And exactly right – samplings of the best restaurants in town is the best way to figure out where you’ll be eating later that night!! Ok I’m seriously glad I ate dinner before reading this because…drool. Those springrolls (trade you cake if you share?) look amazing! I’m definitely interested in the olive oil part as I know nothing about them! Maybe I need to start getting creative. Lol time for a midnight snack perhaps :P Hmmm I’m normally a stickler for cake, but I’m not sure even cake warrants a trade of those delicious spring rolls!! 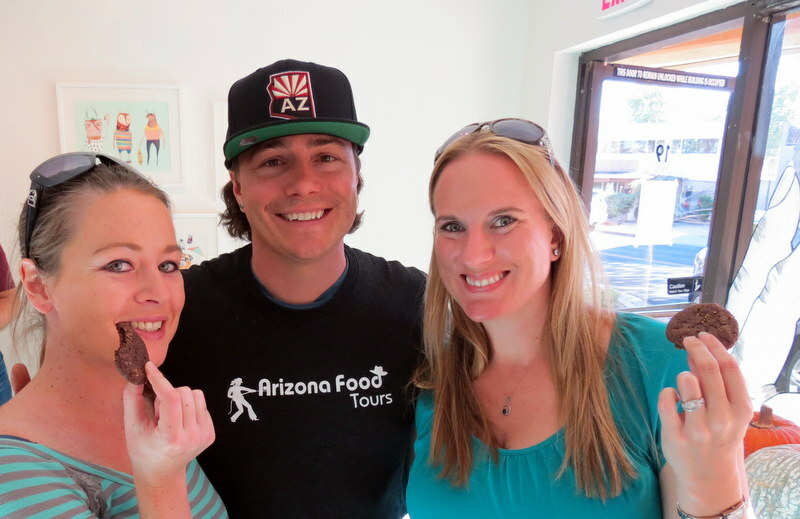 Definitely look into food tours if you’re in Arizona – was a great way to see the city and snack on lovely culinary delights at the same time, and we really did learn a lot! I shouldn’t have read that post before my lunch… everything looks and sounds so yummy and right now I daydream of going there to try all these goodies! Lol I’m coming back to reply to comments and every time I do, all i want to do is eat…even though I did just have lunch. Lol I may have to only come back to this post before mealtimes!! How delicious!! I love pulled pork and those tacos look divine! I get a bit like that with spring rolls too! I discovered food tours for the first time in 2014, first at home in London then Slovenia and I think they’re such a great way of discovering a city. 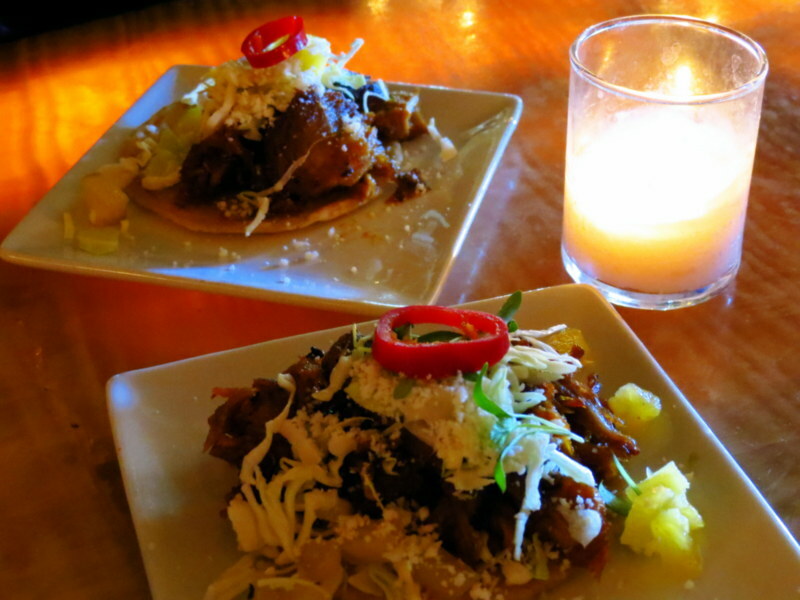 OMG the tacos really were divine – I’ve never had something melt in my mouth in such a delicious way!! Would love to try a food tour in London or Slovenia – will have to get on that when we’re there next! We love our food tours! This one looks great. The Italy food tour we did is probably our favorite to date. I remember being extremely full at the end! I cant even begin to imagine how amazing a food tour through Italy would be! OMG the pizza, pasta and gelato…oooh and the wine!! Sounds absolutely heavenly! Now to book a trip to Italy!! Dang girl, this looks amazing. Love me a good food tour. Am just coming off 3 weeks of eating amazing Asian foods, not at all wanting to go back to our kinda tukka. Except maybe for pulled pork. All hail the pig!!! Could go a pulled pork taco. Seriously those pulled pork tacos were amazing lol I’d travel the world for another one if I had to!! I can’t wait to get to Asia to try a range of different authentic foods – I imagine it would have been downright amazing!! Chinese food is the best! Wow, looks like a must do activity when in Arizona. I think specialized food tours are a great way to discover the best of local cuisine, specially if you’re in a new city for a few days only. It definitely is! This is the first food tour we have done, though it’s definitely starting a trend I think! Such a great way to get a feel for a destination, and as you said, discover the local cuisine for those only in town on a short visit. Awww shucks Megan, here I was thinking you were impressed by the spicy calamari I ordered to share! But seriously, great post, and adding this to my will-do list next time I am in Phoenix. That calamari was divine! Seriously, it’s actually my absolute favorite :D! I’ve never been on a food tour and now I’m kicking myself for that! I love food! And I may have been drooling while reading through this. Since I live in Amsterdam, I should probably start here first, but I will expand! The taste buds demand it! Thanks for the inspiration! This was my first and I couldn’t believe I hadn’t gone on one sooner!! From what I’ve heard from other travelers, Amsterdam should have some pretty amazing food tours – you have quite the cuisine over there in the Netherlands! What I loved most about the tour was that it was so much more, in jumping between resturants, bars and cafes we actually got a historical walking tour with commentary from our guide along the way. I’m sure it would be the same in other destinations.